Even when old time radio's most famous miser is feeling miserable, he's still a master! Jack is healing his mind, dealing with doctors, and reeling from the bills - but the one-liners fly even when the fever is high. Got a cold? Flu? Let Jack, Mary, Rochester,Dennis, Phil, and the whole gang prove to you that laughter really is the best medicine! Most often heard as Jack's pompous medical practitioner was the inimitable Frank Nelson. Who better than a snide, abrasive physician to make this perfect parody of a pathetic patient squirm? Yes, a visit to the doctor was reliable for wry humor (if not a cure)! 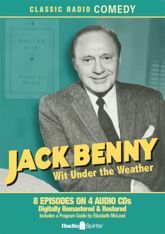 Includes 8 digitally restored and remastered episodes, and a Program Guide by Elizabeth McLeod featuring photographs and a history of the ultimate comic hypochondriac.